Preheat the oven to 400 degrees. Slice the tomatoes in 1/4 inch slices and salt heavily. 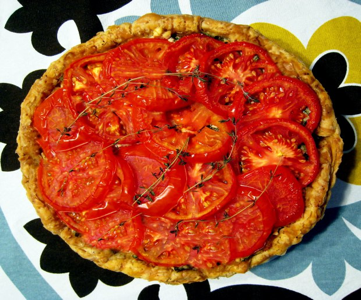 This is so that excess water comes out of the tomatoes and keeps the tart from getting soggy. Leave the salted tomatoes aside for ten minutes. After ten minutes, use a paper towel to wipe off extra salt and moisture from the tomatoes. Arrange the puff pasty in a pie or regular baking dish. Make sure to add a little bit of butter into the tray before putting the pastry in to prevent it from sticking. Spread the Dijon evenly over the pastry. Add 1 teaspoon of thyme then arrange the tomatoes on top of the Dijon and thyme. Add the other teaspoon of thyme over the tomatoes. Drizzle the balsamic vinegar on top. Garnish wish a few sprigs of thyme. Bake for 45 minutes or until the pastry is a deep caramel color. You want to take it out just before the edges begin to char, and not sooner.